Jug Honeyluv, the queen of Philippine underground hiphop celebrates her special day with artists under her organizations and close friends. 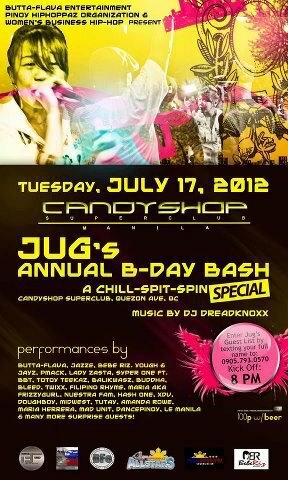 An exclusive gathering of artists with a mini-program was held as a Special Chill-Spit-Spin night at Candyshop last July 17. Jug jammed with her other rappers at Womens' Business Hiphop as they sang an untitled and experimental song which was applauded by the crowd. Dance Pinoy Team showcased the different techniques of hiphop dance in their performance. Bebe Riz sang again Skin and Bones with the night's host and then later on had a duet with the birthday girl as they sang Too Hot to Handle.